Whenever the death of a planet comes around. You always need a Green Lantern around. Not just for fun, but to kick up the bum, whomever it was that killed ground. As Written by Peter Tomasi; Drawn by Fernando Pasarin; and Published by DC Comics in November 2011. 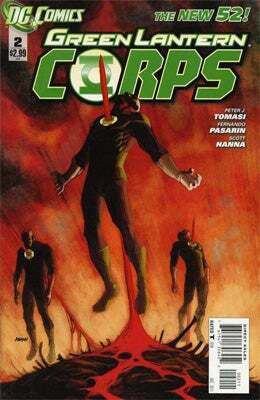 In this issue of Green Lantern Corps, Green Lanterns, Guy Gardner, John Steward, Isamot, Sheriff, Vandor, Hanuck, and another one that I did not catch the name of, start there investigations as to why someone has killed two corpsmen, murdered all of the inhabitants of the planet, Nero, plus taken their water as well. Thankfully, though, a part of this dilemma is answered for ‘the green-gang’, when they go in aide of the inhabitants of the planet, Xabas – because a gang of masked warriors are a plundering their natural resources there. 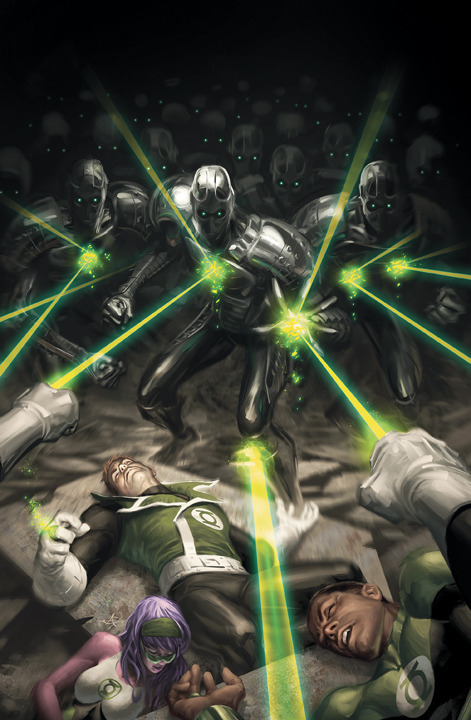 Fortunately, amidst this battle, five of these Green Lanterns eventually manage to subdue these warriors, whilst Isamot – on this own – attempts to make a sacrifice – only to then, in turn, be pursued by a large army of these warriors. Elsewhere, a hooded figure contemplates in the dark. Whist the hooded figure is musing to himself in that dark and desolate planet, he says ‘We never value what we have until it is gone’. Errr – yes and no really – because this issue of the Green Lantern Corps (unlike the previous one), did focus more on plot, whilst at the same time less on character. Now please do not get the wrong idea when I say this, there was some charm to this issue – and it did have a bit of a story. Though that was all it had really – ‘a bit of charm’ – and needed more depth to the plot, so we – the readers – could connect more with this tale. Also, why weren't the ‘masked warriors’ given names? Maybe they will next issue? Huh? Now on the reverse side of this argument, I did like the way that some of the ‘subsidiary Lanterns’ got some time to prove their worth – that was the best thing about this book – that, plus the name ‘Sheriff’. Yes – very nice indeed. Fernando Pasarin has a very nice and detailed flair in his line work, and he has always been able to add an edge and zeal to his compositions and detail. In addition to this, I have to complement the colourist, Gabe Eltaeb, too – particularly for his depth on ‘dark world’. OK, I know that this may sound a bit strange, by my favourite scene in this issue, was the one in which the hooded figure talked to his ‘follower’ on that dark and desolate planet. It was as though this segment came out of the movie or something – particularly the tone of this scene – as it did have that imposing and impending vibe that – for me – had some gravitas. Even though the battle between the Green Lanterns and the masked dudes on the planet Xabas was very well illustrated, and did have a pace and a tone to its composition - I have to say, that it did kind of bore me after a while. Heck, I felt myself saying ‘get on with it’, just because there was a ‘samey’ feel to this scene - which did not bring anything new to the table. As much as it only has a slight connotation with this issue, I just have the gumption to say ‘I shot the Sheriff, but I did not shoot the deputy’. Whilst reading this comic book, a television show popped into my mind straight away. It is a crime-based show involving investigations (like this book) – with personal poses that are bold and vivid (like this book) – and instances in it, which are kind of cheesy too (like this book). ... just add a sci-fi element and we have a match. A reduction on the battle scenes and an increase in the characterization. Tomasi always does his best when he is ‘in’ the character – and, for me, in this issue, this does not seem to be the case. Not a bad issue really. Granted, I would have liked it to have been in a similar vein than the previous one – which was more personable in tone. But it still had a story to tell, and a plot to progress. Nice – nothing more – just nice.